Staff at the Cornish based charity Shelterbox have said their volunteers in Burma are in good spirits despite difficult and frustrating conditions. It has been confirmed that they were the first UK relief team to land in the cyclone-hit country. 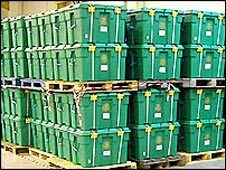 Workers at the charity's headquarters in Helston, Cornwall, have prepared another 1,000 survival boxes to be flown to Burma during the week. The boxes contain enough equipment to house a family of 10 for six months. The first consignment of boxes arrived in Burma several days ago and is being distributed to cyclone victims. The charity's operation there is being co-ordinated by a four-strong team of volunteers, led by a fireman from Cornwall. Tom Henderson from ShelterBox said they were "absolutely delighted" to have made it into Burma so quickly. He said: "Our team was on the doorstep of the Burmese embassy in London when it opened last Monday and the fact that we have worked in 44 countries, our reputation and the quality of the product, persuaded the Burmese authorities to give us visas. "We were able to nip through a rapidly closing door." He said of the situation in Burma: "It is a disaster, we all have to understand that it is another Tsunami."